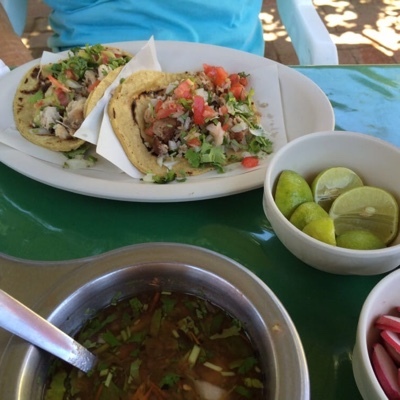 My detailed guide to visiting Cabo. Where to stay. What to do. Where to eat. I’ve been going to Cabo San Lucas with my best friend every year since 2012. While I’m not sure I would consider myself a travel expert, I’ve learned a few things over the years and often friends and family ask me for advice. After tiring of writing and rewriting emails of my various vacation notes I decided I should share this advice with everyone here. Many airlines fly in and out of the Los Cabos International Airport (airport code: SJD) in San José del Cabo including American, Alaskan, Southwest, and even the dreaded United. Fly whichever one works out best for you, as long as it is not United. I love American Airlines but on a 2015 SJD->LAX return flight the back third of the plane was packed while the front of the plane was empty. Apparently, American had tried to sell most of the plane as upgraded seats and no one bought the upgrades. After everyone had boarded the flight attendant told us we could sit anywhere and I was able to grab an entire exit row for me and a friend. SJD airport does not have traditional jetways so instead you will walk down the portable stairway and depending on where your plane parked you will either take a bus for about 1/4 mile to the terminal or simply walk to the terminal. Once inside you will go through immigration where you will be required to turn in your customs declaration and entry registration forms. The flight attendants will give you these forms on the plane but they never provide anything to fill them out with so bring a pen on the plane with you so you can have them filled out before you land. The entry registration (FMM migration form) can be split into two and you must fill out both parts of the form. The immigration agent will keep the top part, and stamp the bottom part, which you must keep and give to the airline when departing from Mexico. I recommend you keep this tucked into your passport. After immigration you will enter a room with several luggage beltways. Once you have your luggage head towards the only exit to meet your ride. One time I barely made my connecting flight in LAX which meant that my luggage was not on the same plane I arrived on. The people at the luggage desk were very helpful and spoke good English. They said they would deliver my luggage directly to my hotel and not long after I checked in it was there. In the hallway before the exit will be many people trying to sell transportation and activities. Many websites will try and scare you and tell you these salesmen are aggressive, but I don’t recall a single one of them ever approaching me. Just ignore them because you read this guide and therefore have already made arrangements for transportation. As soon as you exit the airport there are two bars, one to the left and one to the right. Stop here for a margarita or two, as they are the best margaritas you will ever have. They are not weak so if you are renting a car you may want to limit yourself to one. If you have hired a driver they usually will let you bring one with you. If you happen to get delayed on your way out of Cabo there is a Priority Pass airport lounge in both Terminal 1 and Terminal 2 with free drinks and wifi. American Express Platinum and Chase Sapphire Reserve credit cards get you free Priority Pass membership, but you must have signed up for Priority Pass in advance. Depending on your Priority Pass membership you may be charged $27 for additional guests. I’ve never taken a taxi to or from the airport, so I’m no help here. In town taxis are readily available and they seem to have a rate card instead of meters. Within the Cabo San Lucas hotel zone nearly every ride seems to be $9 (they want to make sure they get that $1 tip). If you leave the hotel zone prices seem to get go up quickly. I believe I once paid about $30 to go from the Medano Beach area to Sunset Mona Lisa. You could book a shared airport shuttle for around $13–25/person (depending on where your hotel is) but at this point you will be excited to get your vacation started and if you are staying down in Cabo San Lucas the shuttle will make several (very annoying) stops to drop off other passengers first. Therefore, if you are not renting a car I suggest you take a private car. A private Suburban from Hostransfer will cost $150.00 round trip (I also tip $20 each way) and will get you a very nice air conditioned private ride from and to the airport for up to six people. The big advantage here is that your driver will stop and wait while you get groceries and supplies. Another great advantage of a private car over the shared shuttle is that on your way out of town the shared shuttle often wants to pick you up at least 4 hours before your flight since you will have to make all the same extra stops to pick up others on your way to the airport. Driving in Mexico is not as scary as one might think, especially if you avoid the dense areas of “downtown” Cabo San Lucas, and if you want the ability to get away from the hotel you shouldn’t hesitate to rent a car for your trip. Most hotels do not charge you to park overnight but you may want to ask and you may want to be prepared to tip the valets if they handle the parking at your hotel. I have heard good things about Cactus Rent A Car and their Yelp reviews seem to agree so I would recommend looking at them. There are a few toll roads around Cabo, including the main route between the airport and Cabo San Lucas, so be prepared to pay the ~$3 toll. The toll takers will accept pesos or US dollars. If you don’t have cellular data be sure to grab some maps from the rental agency because you won’t want to use Waze or Apple Maps without an International data plan. I have not run in to any places in Mexico that do not accept US dollars so there is no need to convert any money to pesos. That said, any time you pay in US dollars you need to be aware of what the exchange rate at that place of business is. Many will have it posted and it is usually 20–25% worse than the official exchange rate. For example on a 2016 trip the exchange rate was about 21:1 but many businesses had posted that their rate was 17:1. To combat this I suggest you get a credit card with no foreign exchange fees as the credit card companies always give you really good rates close to the official excghange rate. When paying with credit card most vendors will ask you if you want to pay in dollars or pesos. Always use your no-foreign-exchange-fee credit card and pay in pesos. In Cabo San Lucas most vendors do not accept American Express, so be sure to have a no-foreign-exchange-fee Visa or Mastercard. This was in contrast to Cancún and Playa del Carmen where many vendors had signs up stating that they happily accepted American Express and some seemed to prefer it. You will not need much cash except for taxis, water taxis, street vendors, and tips, but you should have plenty as some places such as EcoCat snorkeling tour offer steep discounts for cash. When paying in cash with US dollars the locals will almost always give you your change in pesos and this will always be to their benefit. 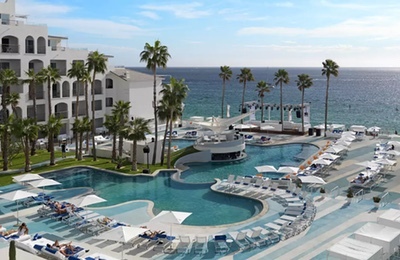 If your hotel allows you to bring food/drink (ME Cabo only allows it if you are a timeshare guest, but not for hotel guests) you will want to stop at La Comer (formerly Mega) in either San José del Cabo or Cabo San Lucas, Costco, or Walmart. All three stores sell alchohol and beer as well as food and other items. 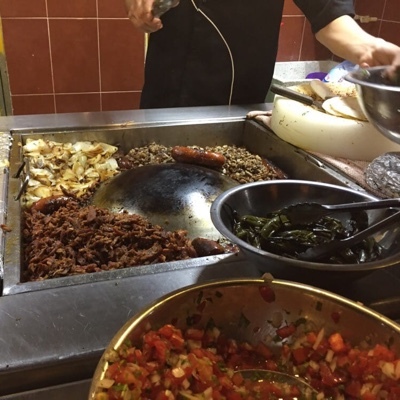 La Comer is very much like a Walmart, whereas the Costco is just like Costco in the US—meaning large portions and less selection. Your US Costco membership is valid in Mexico. I prefer to be in the Medano Beach area because I like to be walking distance to all the bars, restaurants and shops in town as well as the marina area. I have never stayed in San José del Cabo. The Medano Beach area is the most popular area in which to stay. Casa Dorada is my favorite place to stay. The location is perfect as it is right on Medano Beach and right near many great restaurants. Every room has an ocean view and the rooms are very nice and include a kitchen, which is good because the dining and bar options at the resort are extremely overpriced and are not recommended. I have not been to the spa at Casa Dorada. If you are an Interval International member you will have a hard time exchanging for this resort. Within Interval it is called Casa Dorada at Médano Beach and has resort code MBE. 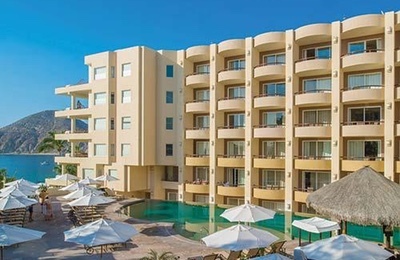 Be careful not to confuse it with “Casa Dorada San Lucas Bay” which is actually ME Cabo or with “Casa Dorada Spa and Golf Resort” or “Casa Dorada Cabo Real” both of which are in San José del Cabo. I have only stayed at Cabo Villas for one night, but I would definitely stay here again. It is next door to Casa Dorada so the location is just as desireable. Very few of the rooms appear to have an ocean view. One bedroom suites seem to only have a kitchette while the two bedroom suites have a full kitchen. I don’t have any experience with the dining and bar options but they do have a rooftop Baja Brewing Company. Although you can take an elevator nearly to the top I do not believe that the Baja Brewing Company is wheelchair accessible as we had to take a flight of stairs up the last floor. The night we stayed here there was a band that played until about 11 p.m. and the music could be heard in the room. Cabo Villas used to be readily available for exchanges via Interval International, but I have not seen it available since about 2015. Within Interval it is called Cabo Villas Beach Resort & Spa. and has resort codes CVJ and CVY. I have stayed at ME Cabo twice. The rooms I have stayed in are all hotel-style rooms (no separate bedrooms) and the “kitchette” only includes a mini-fridge, microwave, and coffee machine. All of the rooms have an ocean view, except maybe the bottom floor. 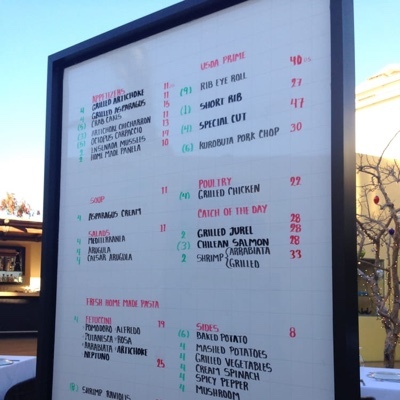 The dining and bar options at the resort are extremely overpriced and are not recommended. I was told they only allow timeshare users to bring in outside food and drink. The crowd at ME Cabo tends to be late 20s—early 30s people who mostly wear Affliction and Tap Out clothing. On Friday and Saturday the pool area plays very loud dance music all day until about 2 a.m.. You will hear and feel the thumping in your room. 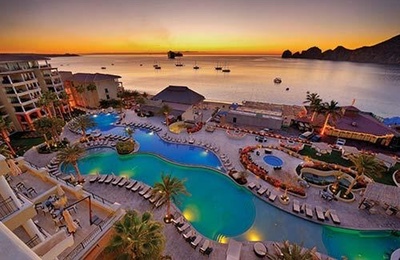 On Interval International ME Cabo is called Casa Dorada San Lucas Bay and has resort code CBO. I have not seen it available for exchange since 2016. In all of my visits to date I have not had an International cell phone plan. If this is the case you should put your phone in airplane mode and then re-enable wifi or follow one of the many guides to avoiding international romaing charges. As of 2017 Verizon offered a “Beyond Unlimited” plan that included talk, text, and data in Mexico and Canada so I plan to utilize that on my next trip. With all of these activities it is best to try and plan at least a day in advance because for some they may sell out. If you are unable to book online (or not booking online in order to get a cash discount) I suggest calling because although every place will answer your email it is my experience that many of them only check email once a day. All the major resorts will have a concierge who will be happy to help you book. They won’t charge you any extra fee, but they will expect a small tip. I normally only book one day in advance just to be able to be flexible in case the weather changes. No one wants to be committed to an ATV or snorkel trip if it turns out to be one of the rare bad weather days. 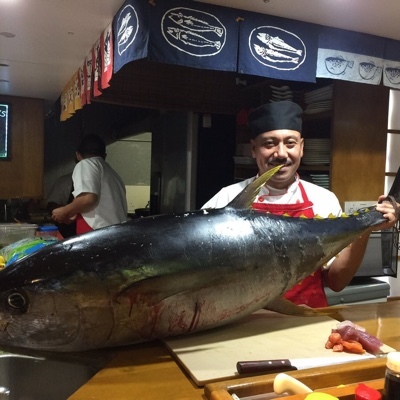 The residents and workers in Cabo San Lucas seem to be very big on tipping—even the grocery bagger will expect a tip (although I never give him/her one). I’ve listed my suggested tips with these activities based on what I’ve given in the past and the reaction it got and the “per person” means per person in your group, not per worker involved in your experience. These are based on my having had a great experience so feel free to adjust based on your experience and budget. I’ve snorkled in both Santa Maria Bay in Cabo San Lucas and Cabo Pulmo. The snorkeling in Cabo Pulmo is worth the extra effort but you won’t be disappointed in Santa Maria Bay. EcoCat offers a great trip to Santa Maria Bay (even though the URL indicates it is Chileno Bay) that leaves from the Cabo San Lucas marina and even offers a winter discount ($41.99) but try to charge you full price ($69.99) if you don’t insist on the discount. They will also charge you 16% tax if you don’t pay cash. The trip includes drinks on the way out and back although the Mai Tais and Margaritas are too sweet. The boat holds about 60 people and is really nice and well maintained. Although there are some spots on the boat where you could hide in the shade, plan on full sun the for the rides to and from the snorkeling spot. EcoCat also has a bar/restaurant at the marina where you can pay for the trip and grab some food and drinks before the trip. 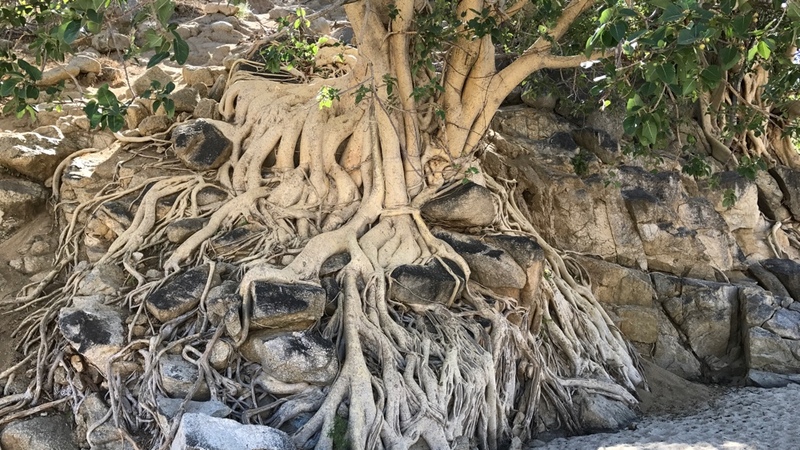 The snorkeling in Cabo Pulmo is absolutely amazing, but you will need to rent a car and plan on a full day trip as it is about a two hour drive from Cabo San Lucas. There are bus trips that run from Cabo San Lucas to Cabo Pulmo, but I prefer to drive. I have heard that Cabo Pulmo Beach Resort has a snorkeling tour where they will pick you up in Cabo San Lucas or San José del Cabo. Cabo Pulmo EcoAdventures has a great snorkeling trip on a small boat (6 people max I believe) for about $45 per person. They do have a 3 person minimum, but even if you only had two it would be worth paying extra to go. Call ahead and book your trip and they may even be able to match you with another small group to meet the minimum. The small boat took us to four different spots and we snorkeled for 15–20 minutes at each spot. The water can be quite choppy and in that small boat you will really feel it so be sure to take your Dramamine ahead of time. Because regular sunscreen contains chemicals that are known to cause bleaching of reefs, Cabo Pulmo requires that you only use biodegradable sunscreen, also called “reef safe” sunscreen. 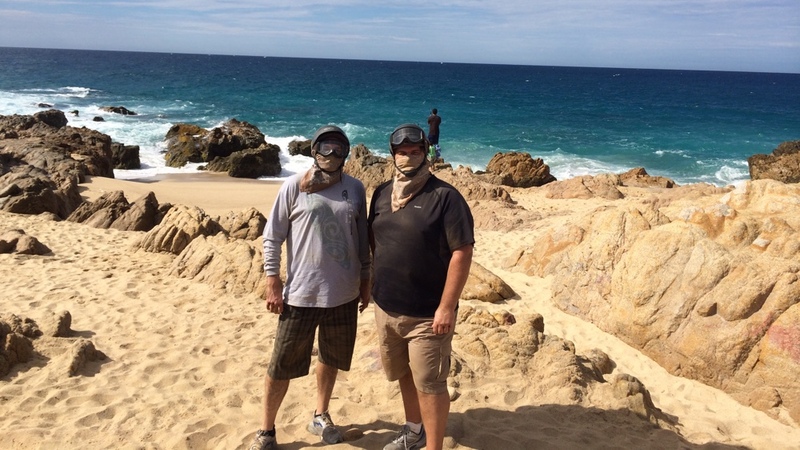 The ATV tour has become tradition when I am in Cabo and it is a great way to see parts of the desert and community you would not see otherwise. 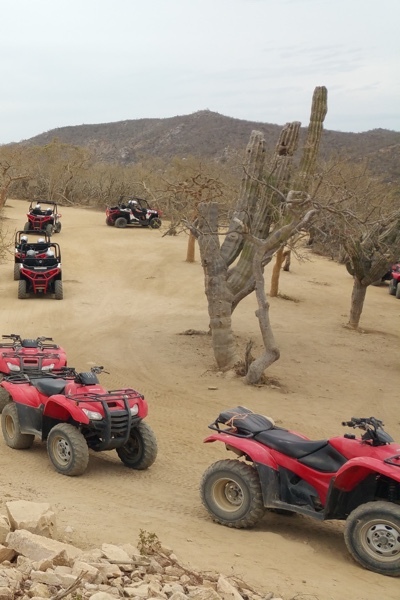 All of the ATV tour companies are located about 30 minutes northwest of Cabo San Lucas and they will pick you up in the morning in a van and return you back to your hotel after your trip. All of the ATV tours I have been on stop at a scenic spot on the beach for pictures. I have used Cactus ATV Tours and have always had great experiences with them but they now only offer 1:30 and 2:30 hour tours which are really only playing around on the beach and the nearby desert and not enough time to see much. 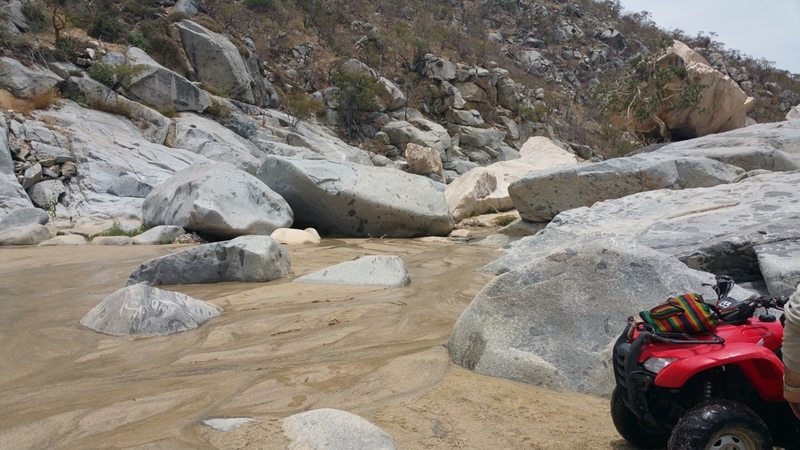 G-Force Adventures offers a much better five hour “Cabo ATV Baja Discovery Tour” for about $180 each which will take you through the hundreds-of-years-old La Candelaria village. Five hours may sound like a lot, but it really is a great tour where you will see lots of other cool sites you wouldn’t see on the shorter trips. I prefer not to have a big group and once talked to G-Force about having the five hour trip be just for me and a friend. They were happy to oblige for a little extra ($100 or $150 extra I think) but we decided to take our chances and it turned out that everyone else was taking the more popular shorter trips and we ended up having a private tour anyways. Had there been a group we had planned to offer to pay to upgrade to private on the spot. Since we didn’t need to I have no idea if it would have worked or not. If you use G-Force ask for your guide to be Henry. 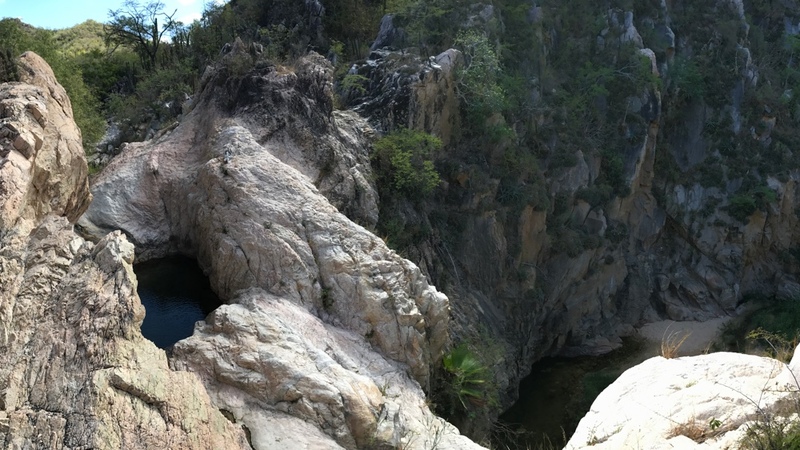 He was great and took us to all kinds of places including a waterfall we had to hike 1/2 kilometer to and even a stop for tortas and beers at a small roadside stand. The ATV companies really try to scare you into purchasing the “damage insurance” for $50/person. I have seen many people buy it but I’ve never seen anyone damage an ATV or get charged for damage. Anything you bring or wear will be covered in dirt and dust so do not bring anything you don’t want to get filthy dirty. Shorts and a long sleeve T-shirt is recommended, but be aware that more than once I have had to throw my shirt away because it would not come clean. Tennis shoes are required, and an old pair that doesn’t necessarily need to return home is recommended. You can comfortably wear a light backpack with some things in it but I suggest that you do not bring a fancy camera as the dust and the jostling could damage it. I bring my phone in a waterproof case that also serves to keep it dust free. Bandanas to tie around your face to help prevent you from breathing in dust are provided but you may wish to bring your own or a buff/neck gaiter that you can pull over your mouth and nose. The tour company will bring some bottled water for everyone but if you are already bringing a backpack you may want to bring a few extras. A lot of people will tell you to visit Todos Santos and to check out “Hotel California” while you are there. I am not one of those people. 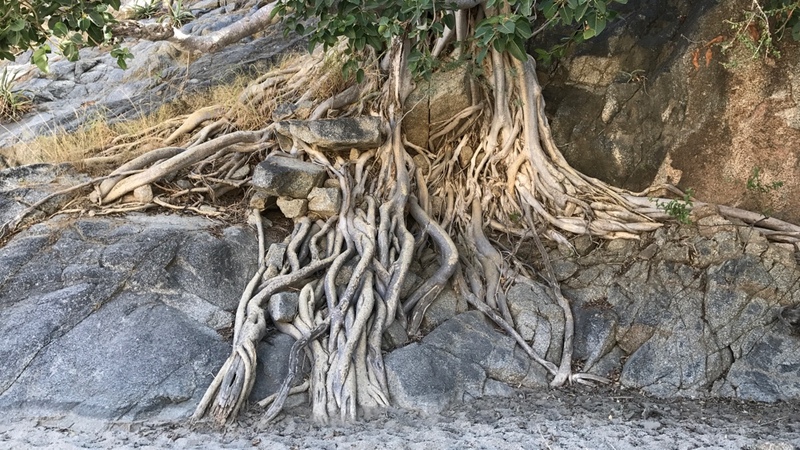 If you are going to Balandra Beach then it is worth stopping in Todos Santos for a bit but I would not recommend a trip just to Todos Santos. I am also the guy who is going to point out that not only does “Hotel California” have nothing to do with The Eagles, the band has actually sued the hotel for trademark infringement and for trying to capitalize off of the 1976 album and song. 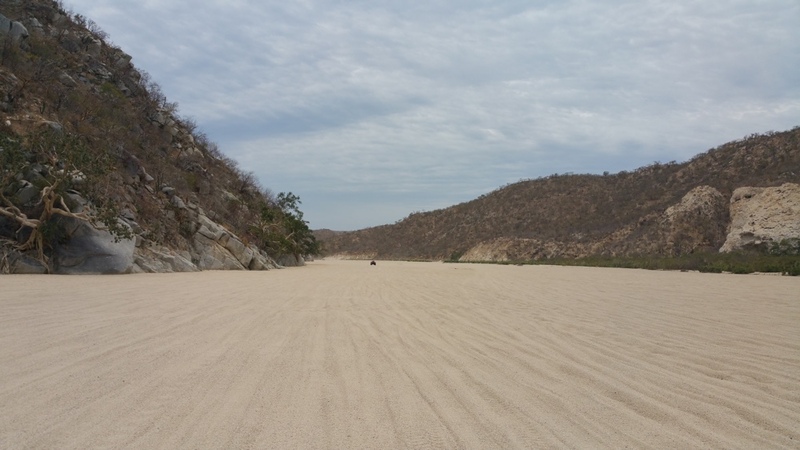 If you already have a rental car and you are wanting to explore AND you have already been to Cabo Pulmo then you might want to check out Balandra Beach. It is small, shallow bay near La Paz where many locals like to go. Make sure you have GPS or good directions because you will definitely feel like you are lost on your way there after going through La Paz. You can rent an umbrella and table for about $12 for the day and there are also stand up paddle boards for about $10/hour. There are usually some young kids selling delicious tacos for about a dollar each and sodas and water as well. I’ve even had a local come to my umbrella and offer fresh ceviche. Check the tide tables before you go if you really want to swim because at low tide the water is less than a foot deep. I like to spend part of my last day in Cabo at The Desert Spa. In 2015 two 80 minute massages was $135 + 15% tip (which they collect up front and suggest the 15%) and it is a $9 cab ride from the Medano Beach area. The massage includes access to the facilities for the entire day so be sure to go early and plan to stay after the massage (we once spent four hours at the spa). The men’s side includes: hot tub, warm tub, cold tub, steam room, sauna, and multiple showers including one that dumps dozens of gallons of water per minute on you from a 4" pipe. Ask for Cleotilde, as she gave me one of the best massages I’ve ever had. I find that I mostly wear swim trunks, shorts, short sleeved button-up shirts, and both short and long sleeved T-shirts. The long sleeved T-shirts are great for days where you will be in the sun a lot especially if you go snorkeling or on an ATV tour. It doesn’t hurt to bring a pair of jeans or pants, but you will most likely find that you end up not needing them. In my experience one spray can is good for two people for two days. If you do not bring enough sunscreen with you expect to pay about $10 per can at Walmart for spray on or double that at the resorts. If you are planning to go snorkeling be sure to bring some biodegradable sunscreen as some places such as Cabo Pulmo require it. Lemon/lime juicer You are going to make your own maragaritas, aren’t you? I always say this is my favorite restaurant in the world. Order the “special cut” steak (ribeye cap) and roasted mushrooms. They also have lots of different fish offerings, none of which I have ever tried because the steak is too good not to order. After hurricane Odile in 2014 the restaurant closed and was going to be rebuilt into two different restaurants, one of which was going to be a re-opening of Corazón de Alcachofa. According to Yelp it has reopened and it still getting rave reviews. The Chamuyo Rib, a huge center cut beef rib slow cooked for hours over a wood fire, is the star of the show. 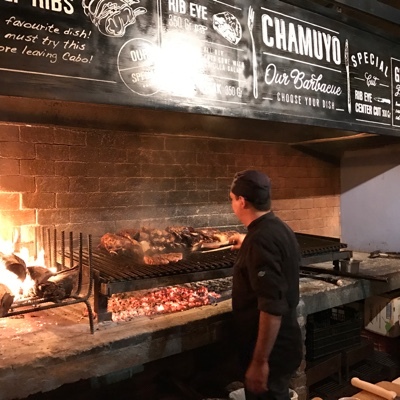 If you are wanting to sample more dishes then get the Parrilla Para 2 Personas (Grill for 2 People) which features some Chamuyo Rib, chorizo, flank steak, criolla salad, and a bottle of wine. I had the ribeye once and it was not as good as I expected it to be. 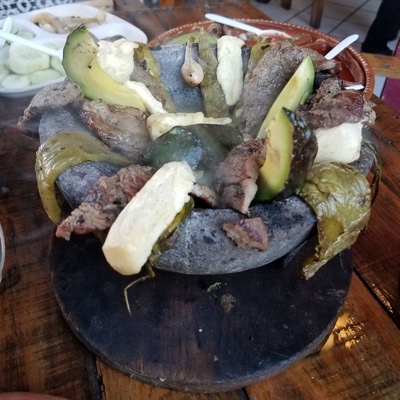 I highly recommend the Stone Bowls which is a sizzling hot molcajete loaded with peppers, cactus, avocado, cheese, green onions, and your choice of meat and served with tortillas and salsas. This sidewalk taco stand features several different types of meats including pastor, asada, and cabeza, all of which were fantastic. There’s no seating but the bar next door is happy to let you sit and eat your tacos if you buy something to drink. Maro’s looks like it is a wild party bar at night, but for lunch it is always cool and quiet. 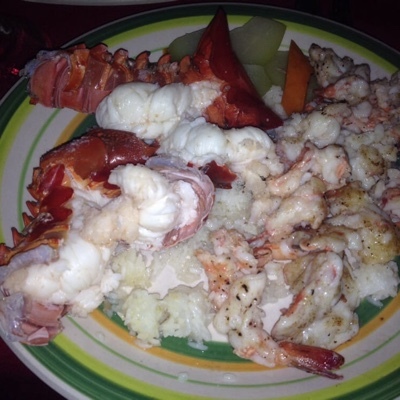 Start with the handmade guacamole and follow it up with the ¼ kilo lobster & ¼ medium shrimp combo which is served with a warm garlic butter. Not normally one to eat sushi in Mexico, I was turned on to this place by guys in the band Green Day who told me it was great. The food is fairly different from sushi in the US as they don’t really feature of lot of nigiri or rolls. 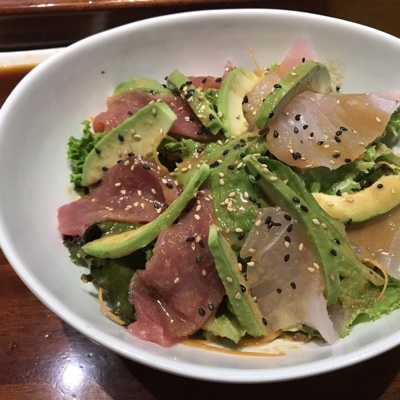 Most of the sashimi-type dishes are heavily sauced, which isn’t my preference. 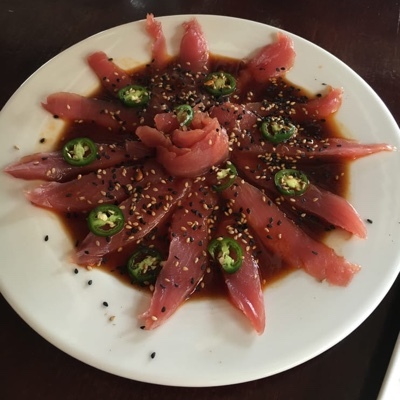 I’ve had mixed experiences here with my first visit being great where we had a sushi chef who was happy to talk with us and explain the dishes to us (the menus are not very descriptive). My second experience was quite the opposite and the sushi chef and wait staff were not helpful and pretended to not speak English at all. Combined with the wait staff who were constantly pushing you to drink (and buy) more water and saké, I’m not sure I will go back and will likely try the Tiki Bar instead. 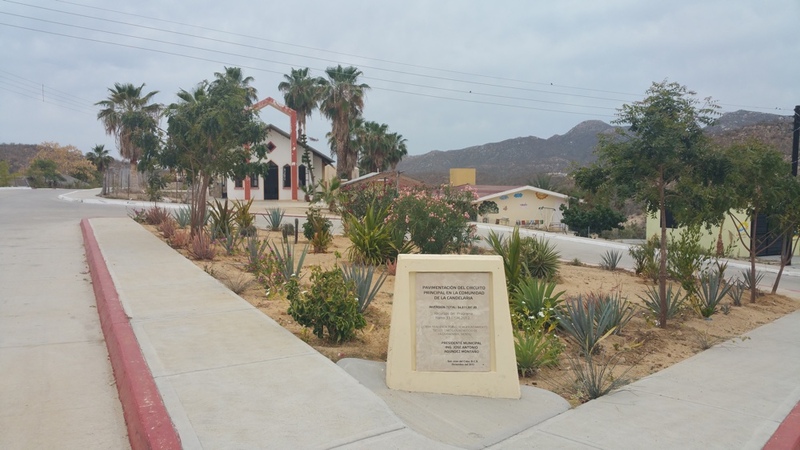 A short walk from the famous San José del Cabo Church, Jazminz is a collection of beautiful little buildings and a courtyard. 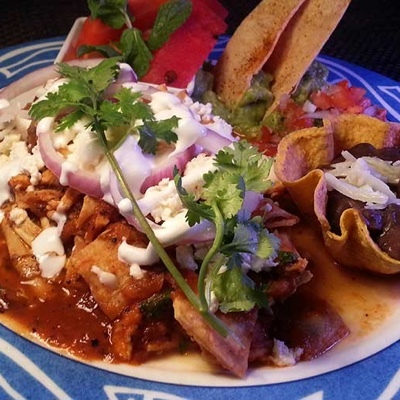 I recommend the molcajete chicken breast. 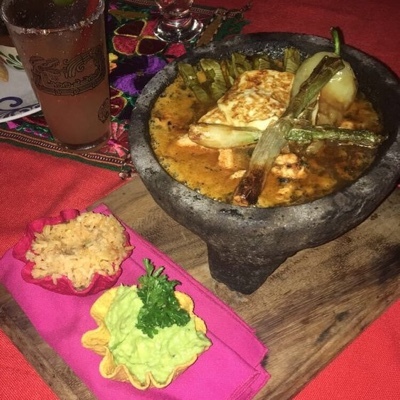 It is very similar to the one at Las Guacamayas (which also has a SJD location) except at Jazminz everything in the stone bowl is simmering in a delicious sauce. 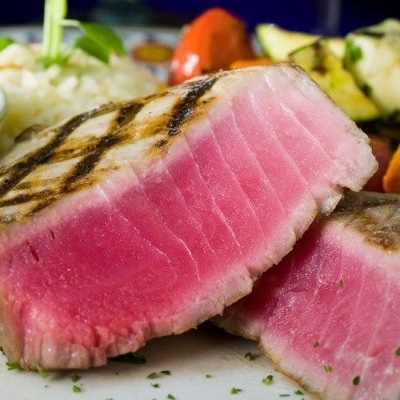 Blue Fish is located at The Shoppes at Palmilla, which doesn’t seem to have a “real” address, but a map is available on their website. 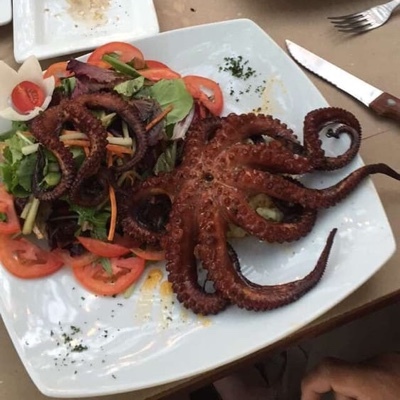 The octopus sashimi was fantastic. This place only serves pig. Delicious pig. 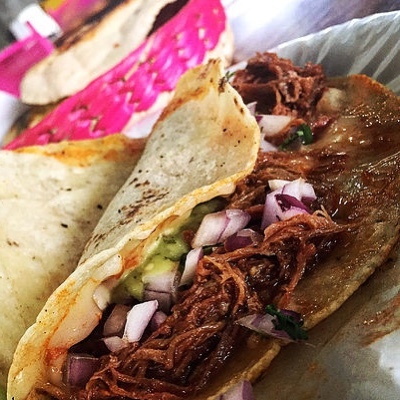 Order carnitas by the kilo and enjoy it with the fresh tortillas and some guacamole. I saw this one on Diners, Drive-Ins, and Dives as well and the show said to try the Chicken Chilaquiles Rojos and stuffed French toast. Also featured on Diners, Drive-Ins, and Dives, the show recommended their krab and salmon stuffed tempura shrimp a/k/a Heavy Nagasaki. I’ve been told this place is great and it is on my list for my next visit.